The Collection is organized into three series: Records, Audio-Visual Material, and Artifacts. The material within each series is arranged alphabetically. In the Records series, the original file labels were retained, as such folders labeled “A”, “Al”, etc. refer to the alphabetical grouping of items in the folder. D. Walter Cohen, D.D.S. was appointed dean of the School of Dental Medicine in 1972, after a twenty year career on the faculty of the Dental School. He succeeded Lester William Burket who had been dean since 1951. Cohen was born in Philadelphia on December 15, 1926 and graduated from Central High School in 1943 and attended the College of the University of Pennsylvania from 1943 – 1945. After serving in the US Navy from 1945 – 1946, he entered Penn’s School of Dental Medicine, and graduated in 1950. Between 1950 and 1951 Cohen was a research fellow in Pathology and Periodontics at Beth Israel Hospital in Boston. Cohen began his teaching career at Penn’s School of Dental Medicine in 1951 as an assistant Instructor in Oral Medicine and Oral Histopathology. He rose steadily within the ranks of the standing faculty at the Dental School, attaining the position of professor in 1963, the same year he was appointed chair of the Department of Periodotics. Between 1969 and 1972 Cohen served as Associate Dean for Academic Affairs in the Dental School. During Cohen’s tenure as dean there were a number of improvements to the dental curriculum. These included an increase in inter-school programs with connection being made with the School of Engineering, Wharton, and the Department of Anthropology. A program was established for individuals with Ph.D.s in physical or biomedical sciences to be retrained and receive a D.M.D. 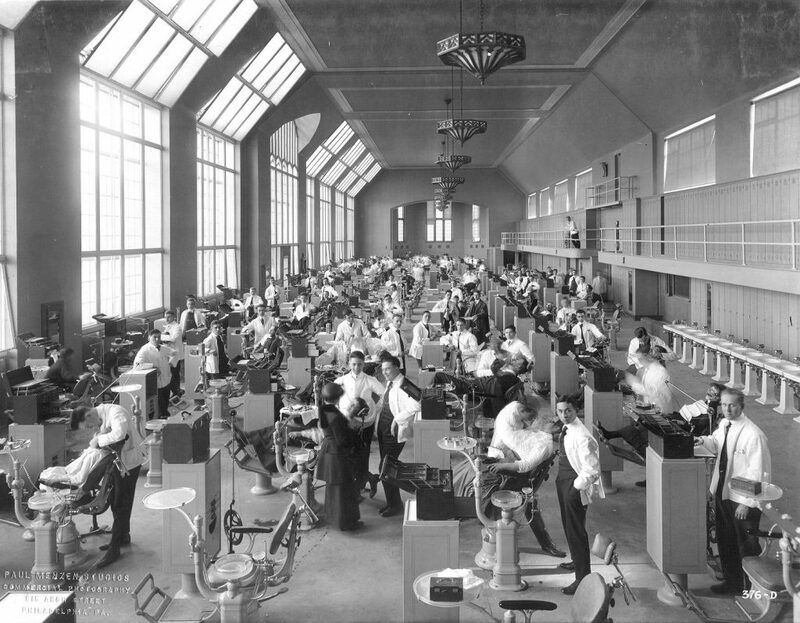 In addition, fourth year students were required to work in a hospital facility, and a department of restorative dentistry was created within the school. Cohen also oversaw the strengthening of the oral health care program, the community dentistry program, and the work done at the Center for Oral Health Research. Dr. Cohen was on the staff at Philadelphia General Hospital, Children’s Hospital of Philadelphia, and Children’s Seashore House. He was also a consultant to the Army, Navy, and Air Force dental programs, as well as to the Surgeon General of the United States. Among his awards, Cohen received an honorary doctorate from Hebrew University of Jerusalem in 1977. Cohen stepped down as Dean of the School of Dental Medicine in 1983 to return to teaching and research. The Records of the School of Dental Medicine Office of the Dean contains material related to the tenure of D. Walter Cohen (1972 – 1983) with some material from the period Lester William Burket (1951 – 1972) held the position. The majority of the records relate to the School’s Long Range Plan and the Pennsylvania Experiment for developing the curriculum in the 1980s. There is also an abundance of material related to the School’s connection to developing dental education in Israel – most notably at the Hadassah School of Dental Medicine at Hebrew University of Jerusalem. Additional material relates to Dean Cohen’s personal interests and scholarly publications. The Collection also contains administrative records and studies for the School. School of Dental Medicine. Office of the Dean. Addendum to the Class of 1973 Curriculum Evaluation n.d.
Dentist Calls for Speakers, n.d. n.d. Applicants for the Negev n.d.
Auxiliary Staff Management Structure n.d. Continuing Dental Education Survey n.d. Cost Containment Issues for Dental Education in the Eighties n.d.
Dentistry: A Way of Life n.d.
Development Study for the Post Graduate Building n.d.
Tropp, Robert Lloyd, n.d. n.d.
Executive Summary Management Process Development at the Pennsylvania Experiment n.d.
Forms: Evaluation Data – Resident n.d.
Forms: Group Leader Appraisal of Students n.d.
Garfunkel, Adrian: Los Angeles Visit n.d.
General Dentistry Seminar Series Pennsylvania Experiment n.d.
Harmon Party Contact Sheets n.d.
Harvard University School of Dental Medicine n.d.
Hadassah School of Dentistry, n.d. n.d.
How to Write an Examinations: A Handbook for the Faculty n.d.
Institute for Environmental Medicine n.d.
Interim Analysis: Educational Component of the Long Range Plan n.d.
Intravenous Sedation – Course Outline n.d.
Introduction to Preventive Dentistry Patient Education and Maturation n.d.
Isler, Stuart, “Pit and Fissure Sealants: A Five Year Clinical Evaluation” n.d. Items in Room 512 n.d.
Jerge, Charles R., “Using Protocols to Organize and Assess the Delivery of Dental Care” n.d. List of Investigators and Research Projects Currently Utilizing the Clinical Research Center n.d. Evaluation Attitude Committee, n.d. n.d.
Model A Faculty Addresses, n.d. n.d.
Model A Vertical Groups and Preceptor Programs, n.d. n.d.
Quality Care Evaluation Data Forms, n.d. n.d. Reorganization of Model A Proposal, n.d. n.d.
Straussberg Model B Financial Projections, n.d. n.d.
Fees for Models A and B, n.d. n.d.
Mann, Wallace V., Jr., “The Case for Optimism: There Must be Pony in Here Somewhere” n.d.
Nizel, Abraham E., “A Guide to Teaching the Science and Art of Nutrition to Dental Hygienists” n.d. Oral Surgery Postgraduate Programs n.d.
Oro-facial Sensory Function and Dysfunction n.d.
Fund Raising Ideas, n.d. n.d.
Project 1 Mechanism of Radiation-Induced Damage of Collagen and its Biological Repair, n.d. n.d.
Project 2 Study of Dental Health Care Delivery Systems in the Negev, n.d. n.d.
Project 5 Assessment of Tooth Loss in Israel as related to need, n.d. n.d.
Project 6 Effect of Occlusal relation on Masticatory Efficiency with Complete Dentures, n.d. n.d.
Project 10 The Role of Collagen in Tissue Repair Processes, n.d. n.d.
Project 16 The Effect of Hydrocortisone on Orthodontic Tooth Movement, n.d. n.d.
Project 19 Support of Doctoral Research and Theses Preparation, n.d. n.d. Evaluation Concepts – Busch, n.d. n.d.
National Advisory Committee, n.d. n.d.
Philadelphia County Dental Society Mailing List n.d.
Plan for Education of the Generalist in Dental Medicine n.d.
Poplawski, Frank and Barry E. Zweig, “Evaluation and Management of Allergy to Local Anesthesia” n.d.
Principles of Practice in Dental Care Center n.d.
Proposal to Establish the D. Walter Cohen Foundation for Advanced Dental Education and Collaborative Research n.d. Recommendations Committee on Dental Education Survey of Dentistry in the United States n.d.
Report of the Evaluative Committee of the Hebrew University – Hadassah Faculty of Dental Medicine Jerusalem, Israel n.d.
School of Dentistry Seventy-Fifth Anniversary Celebration, 1878-1953 n.d.
Student Handbook of the School of Dental Medicine n.d. Schedule for First Semester, n.d. n.d.
Lantern Slides Oral Health Science Building (4 slides) n.d.
T.M. Shumaker “A Focus on the Mandibular Block” (film) n.d. Academic Regalia – Hood n.d.